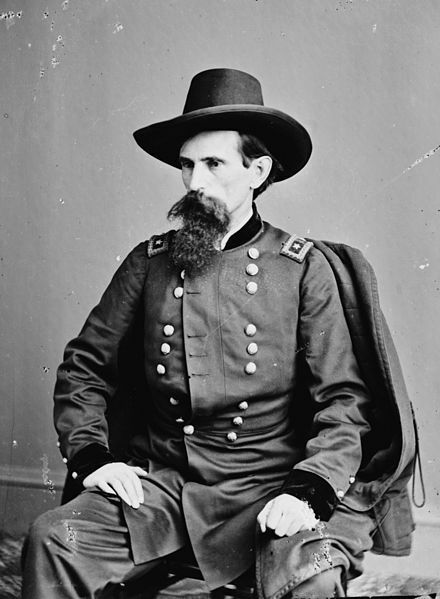 Lew Wallace, adjutant general of Indiana in the early days of the Civil War, became a brigadier general in September of 1861. After the war, he became territorial governor of New Mexico and wrote "Ben Hur." The train that brought L.K. and the rest of William Benton’s company from Richmond on April 18th stopped to pick up soldiers-to-be in Centerville and Cambridge City before arriving in Indianapolis. They were still the first to reach Indianapolis in response to Governor Morton’s call. Indiana’s quota of six regiments filled quickly. Benton and his boys were lucky to become Company D of the 8th Indiana Volunteer Infantry (the numbering began with sixth, because Indiana had sent five regiments to serve in the Mexican-American War). A drawing of Camp Morton from Harper's Weekly in September 1862. As the first volunteers gathered at Camp Morton, they were housed in animal barns and stables. They bathed in Fall Creek, a half mile to the north. The camp filled with volunteers, visitors and excitement. Music filled the air, but it wouldn’t be long before the shouts of drill sergeants and the blast of trumpet calls would become more familiar. This entry was posted in 8th Indiana Infantry and tagged Ben Hur, Cambridge City Indiana, Camp Morton, Centerville Indiana, Civil War volunteers, Fall Creek, Indianapolis, Indianapolis Journal, Lew Wallace, Mexican-American War, New Mexico, Oliver P. Morton, Richmond, territorial governor, William P Benton. Bookmark the permalink.